A Hong Kong court has sentenced former Morgan Stanley managing director Du Jun to seven years in prison after his insider trading conviction last week. Du was also fined $3m (£1.8m) in what has been the most high-profile case of its kind in Hong Kong. The sentence was the maximum and comes amid a crackdown on financial crime. He was found to have made $4.3m from trading stock in a Chinese state-owned investment firm while advising it on the acquisition of a Kazakh oil field. "This sentencing sends the strongest possible message to anyone tempted to commit an insider dealing offence in the future," said Mark Steward, the executive director of enforcement for Hong Kong's Securities and Futures Commission (SFC). Du's conviction is the 10th for insider trading since March this year. Du bought $11m of stock in Citic Resources while advising the company on the purchase of an oil field in Kazakhstan. He sold half the stock for a $4.3m profit after the deal was announced. Citic Resources is an arm of China's largest state-owned investment company, Citic Group. 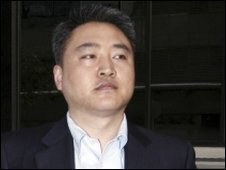 Du was convicted of nine counts of insider trading and one of advising his wife to deal in shares of Citic Resources.